When your internet browser displays the DNS probe finished no internet error message, it’s telling you that your computer’s DNS server cannot process your request to connect to a website. This happens when you have no internet access or when something is preventing your computer to load pages. In that case, your browser is informing you that it was unable to fetch the web page you requested because the DNS cannot provide the page’s IP address. DNS stands for Domain Name Servers. They’re like phone books. They maintain a list of domain names. DNS translates contacts or domain names to IP addresses. People can easily remember domain names, but machines or computers need an IP address to access a website. Internet protocol addresses or IP addresses enable a device to connect to hosts or other devices through the internet or any network. They then exchange data with the host to which they are linked. If your internet connection is slow or your computer or browser has an issue, the DNS error message may show up. You can fix this issue with the following solutions. Many browser related problems can be fixed by clearing your browser’s cache. These include slow page load times and DNS issues. If your browser serves cached images instead of updated web pages, wiping the cache can help you. Next, click the 3 dots located on its upper right corner. A pop-up window will appear. From its drop-down menu, choose all time, everything, or from the beginning of time. Lastly, tick the checkbox beside “cache” and click the clear now button. The network adapter is an internal hardware of a computer. It’s the component that enables computers to connect with servers or any networking devices. Oftentimes, resetting it can solve internet connectivity problems. By using Windows’ command line, you can fix DNS issues. Paste or type it into the command prompt and hit enter. Open your browser, and test your internet access. If resetting your computer’s network adapter doesn't fix the issue, then try flashing the DNS or releasing and renewing your IP. To release IP, type ipconfig /release and press enter. After that, you've to renew your IP. To do this, enter ipconfig /renew on the command line. Open the command prompt again. After running the command, restart your PC. Both OpenDNS and Google DNS are faster than other DNS servers. They’re more reliable than the DNS servers utilized by your internet service provider. OpenDNS is a service that upgrades the features of DNS. It offers optional content filtering, DNS lookup, and phishing protection. Similarly, Google Public DNS is also a Domain Name System service. It’s free to use and is described as a public DNS service that makes the web more secure and faster. Click start menu and search ncpa.cpl. Click it and tap the properties button. Manually type 8.8.4.4. This is Google’s public DNS. You can also use 8.8.8.8. Restart your browser and check your internet connectivity. Open your browser and go to settings. Look for “use prediction services to load pages more quickly.” Uncheck it. Restart your browser and try to load a webpage. 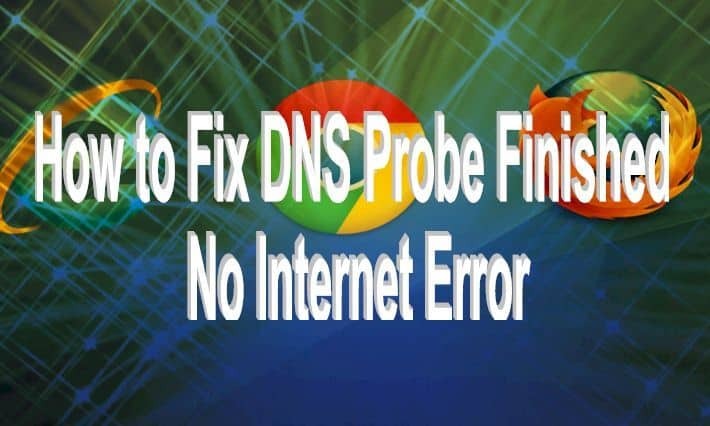 Remember that one of the reasons your browser displays the DNS probe finished no internet error message could be that you do not have internet access. Often, the root of this problem is your networking device. It could be malfunctioning or exhibiting glitches. Click “reboot.” Admin is the default password and username for most brands. Unplug your router from the power source. Try to load a page to test your internet connection. If using the command prompt, power cycling your router or modem, and utilizing other methods don’t fix your problem, it could be time to change your networking hardware. But before that, try different network equipment in its place or have it checked by a technician. By doing so, you’ll know whether it’s really the root cause of the issue or not. An outdated network driver can cause DNS probe finished no internet error. If this is the case, update your network driver. To do this, follow the steps below. Click start menu, type in “device manager” in the search box, and press enter. After opening the device manager, search “network adapters” in the device manager window. There are many options. Look for your Wireless/WLAN driver and right click it. Choose your network hardware and tap “next.” If your computer asks for a WLAN Driver CD, put the driver CD in the CD drive. You can also use other means to connect to the internet. Use your prepaid or postpaid phone as a networking device, or connect to a portable Wi-Fi. After connecting to the internet successfully, update your driver. If you have a stable internet connection prior to installing a browser add-on, the newly installed extension may be malfunctioning. It may also be blocking your internet access. Test your connection by using a different browser. If you can load pages on other programs, you must remove the extension installed in your primary browser. When you can’t access web pages and your browser displays the DNS probe finished no internet error message, something is preventing your computer from loading pages. It can be a malfunctioning program or extension, a misbehaving internet provider, a defective modem or router, or an outdated driver. The first thing you must do when you can’t load pages is to run a networks diagnostics test, unplug and replug the LAN cable, or reboot your computer. If these options were unable to resolve the issue, you should use the solutions mentioned above.